There is metal corrosion throughout my home located at 6111 Yeats Manor Drive and built by Lennar, including the appliances. This is the oven. 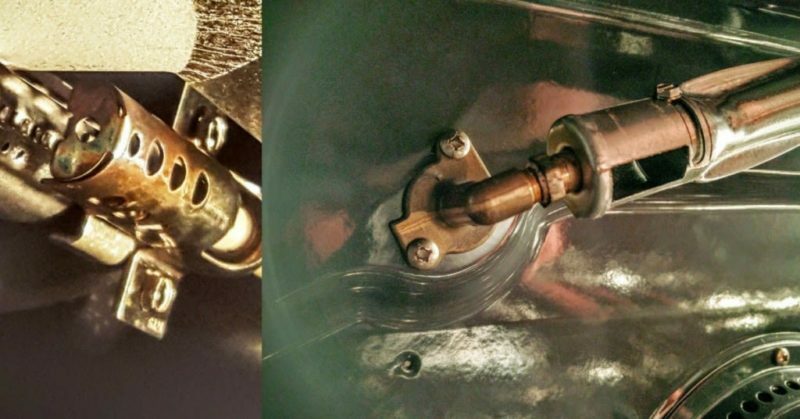 The anti-tip bracket was never installed either, which is very dangerous. As you’ll recall, I have similar issues with metal corrosion and discoloration of the pipes, in the dishwasher, inside the ceiling fans, and inside the microwave oven. This is not isolated. After an odd home inspection by WCI Communities (now Lennar), I went around the house taking pictures. He was fixated on the pipes, even though there were no plumbing issues at the time, except for the sewer cleanout that’s buried. Here’s what I found inside the gas oven that I’ve only used a few times in 4.5 years. A part in the gas oven that has visible signs of discoloration and metal corrosion in the new construction Lennar home located at 6111 Yeats Manor Drive in the Westshore Yacht Club neighborhood. 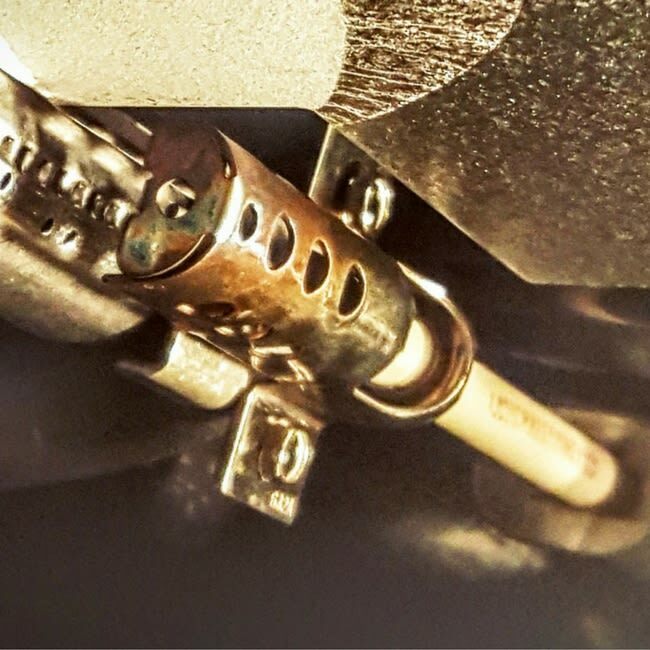 A closer look at the part inside my gas oven that has visible signs of metal corrosion and discoloration. There is corrosion throughout the house built by Lennar and located at the Westshore Yacht Club in Tampa – including most of the appliances. 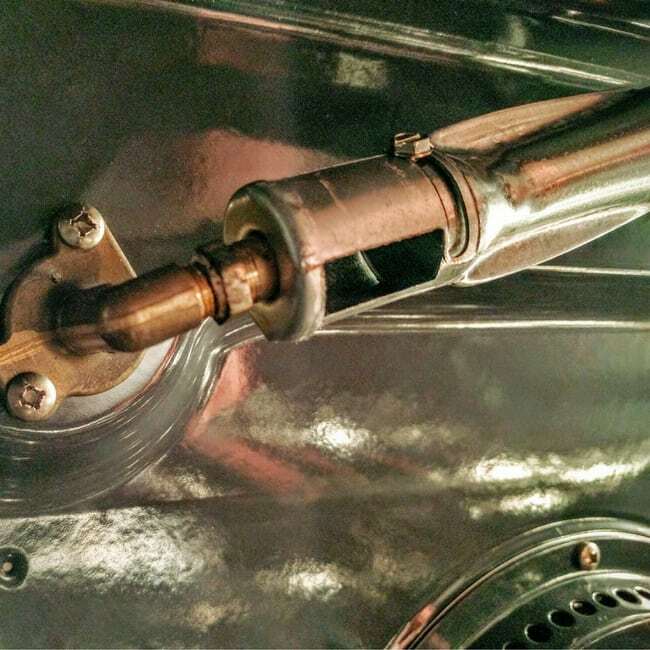 Other parts in the gas oven show signs of metal corrosion and discoloration. The house was built by WCI Communities (now Lennar) at the Westshore Yacht Club. There is metal corrosion throughout the house and in the appliances – including my ceiling fans. There is a suspicion that a corrosive vapor from the ground is accumulating and escaping from the ground into the pipes. That would explain why much of the metal corrosion is found in more confined spaces. For example, the ceiling fans that are rusted and corroded on the inside (but show no signs of rusting on the outside) are in confined ceiling spaces that are exposed to wall piping. This would further explain the oven because it’s a gas stove exposed to natural gas piping under the ground. Again, this stove has only been used a few times in 4.5 years. RELATED: I Answer Mark Metheny's Question - "How Can We Make This Right?" It’s likely a multitude of problems, including a factory that was on the Westshore Yacht Club land that was never fully remediated, as well as the constant and ongoing air conditioner issues in the home that impact air quality. There is also a 45+-year-old jet fuel pipeline just feet under the ground and feet away from the back of my house. I paid for inspections after my first-year warranty walkthrough because it was just a disaster. One of the items they found was that the anti-tip bracket was never installed to the oven. 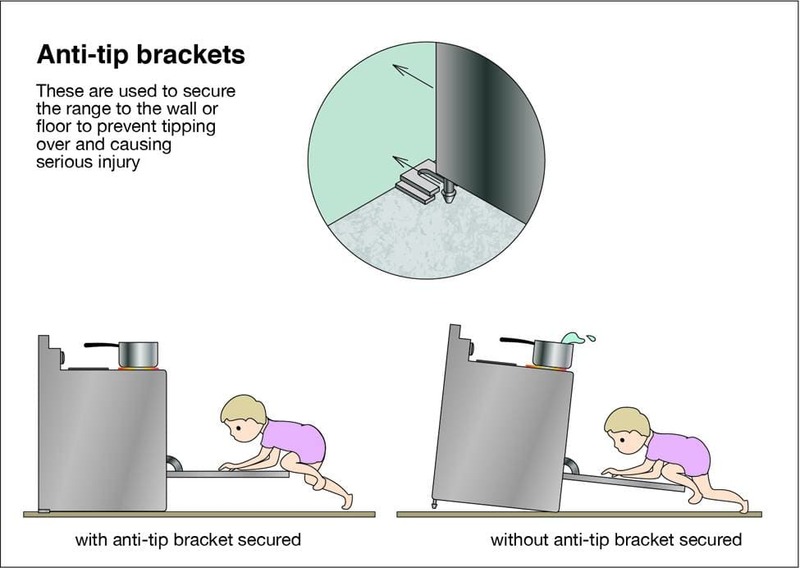 I didn’t even know what that was, but here is a great explanation of the purpose of the anti-tip bracket. Yes, it’s required (yet another reason to wonder how this home ever passed inspection). The picture below is a great visual of the oven anti-tip bracket provided by WIN Home Inspection. 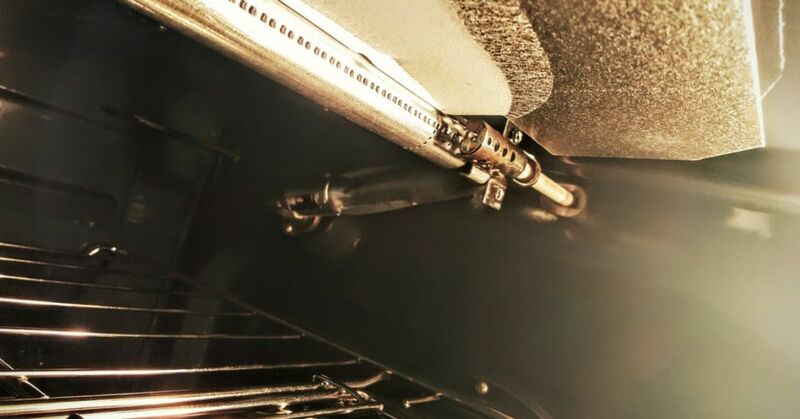 The oven anti-tip bracket is not only required to prevent injury and death to children, but anything heavier (think a turkey) that is placed on the open door could potentially tip the oven. In 2014, Joel Fedora of Lennar indicated the manufacturer would be responsible for installing the anti-tip bracket for the oven. After a confusing and frustrating round of conference calls to discuss home inspections for 80+ construction problems, I asked Richard Hudak and Steve Smith how I would test if the anti-tip bracket was installed. They indicated how to test for it, but also said they would do it when they came back for more inspections. 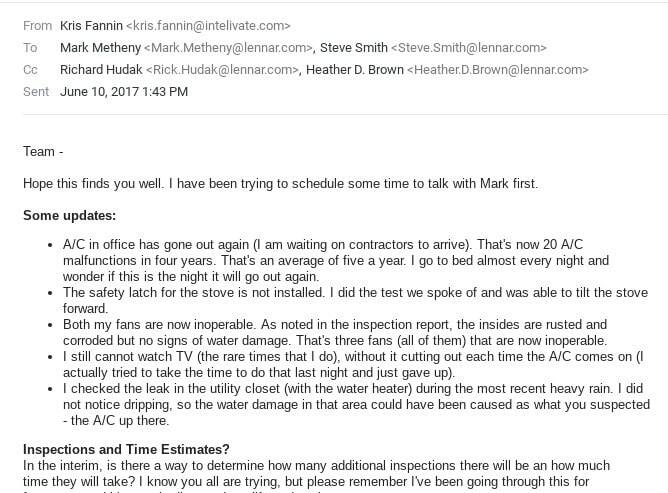 After Mark Metheny sent an email to me indicating he wanted more inspections, including an initial visual inspection by an environmental company, I followed up with emails and phone calls. Mark Metheny of Lennar wanted to bring in an environmental inspection company in addition to other home inspections based on the numerous construction issues and evidence of metal corrosion in the 6111 Yeats Manor Drive property located at the Westshore Yacht Club. Communication regarding a new construction Lennar home at 6111 Yeats Manor Drive in the Westshore Yacht Club. All I received back two days later was an email from Mark Metheny – Division President of Lennar – saying he would follow up on this ASAP. That was June 12, 2017. It’s now November of 2017. I have heard from none of them since.